Line and grease a 6" springform pan. Combine the graham crumbs and melted butter in a bowl. Press the graham crackers into the bottom of the prepared pan and set in the freezer for 10 minutes as you prepare the cheesecake filling. Combine the cream cheese and sugar until light fully combined. Add in the cool whip and mix until just combined. Separate the cream cheese mixture into 4 bowls and add pink dye to one, orange to one, blue to one, and purple to the last. Stir to combine. Remove the graham crust from the freezer and place large dollops of the filling all over the crust in a random pattern. Use an offset spatula or the back of a spoon to smoth the cheesecake down. Place in fridge and let set for at least 2 hours. Place the pink, orange, blue and purple candy melts in small, separate bowls with 1/2 Tablespoon shortening or coconut oil. Heat for 35 seconds, stir, and reheat as necessary until the candy melts are smooth. Let the candy melts cool as you carefully remove the cheesecake from your springform pan and smooth down the edges as needed with an offset spatula (run it under hot water to help). 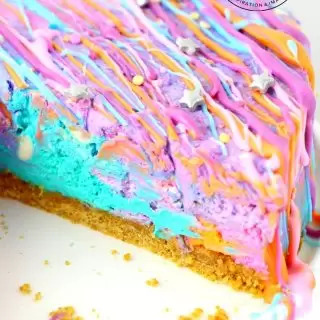 Drizzle the cooled candy melts all over the cheesecake and then sprinkle the unicorn sprinkles overtop while the candy melts are still wet. Let the candy melts dry, about 10 minutes, before serving.